Hotel DUO is situated 12 min by subway from the city center. Travel from the the Vaclav Havel Airport Prague takes by public city transport about 50 min (see details). 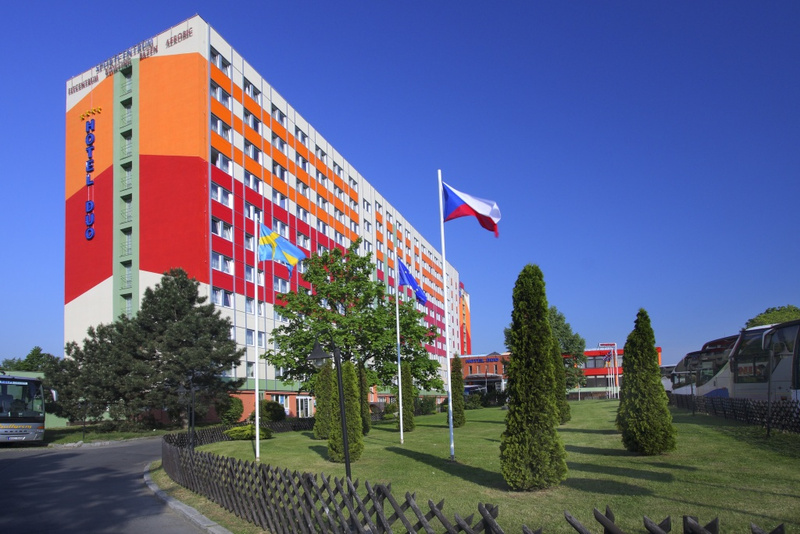 For those traveling by car, Hotel DUO is located in the proximity of the D8 highway from the direction of Berlin - Dresden - Teplice and offers to guests a large parking lot in front of the hotel. Public city transport: Take the bus No. 119 direction to the city center. The bus No. 119 terminates at the subway station "NADRAZI VELESLAVIN" (line A - green). Continue by subway and change the lines at station "MUZEUM" to route C (red line) and go to station "STRIZKOV" (direction LETNANY). 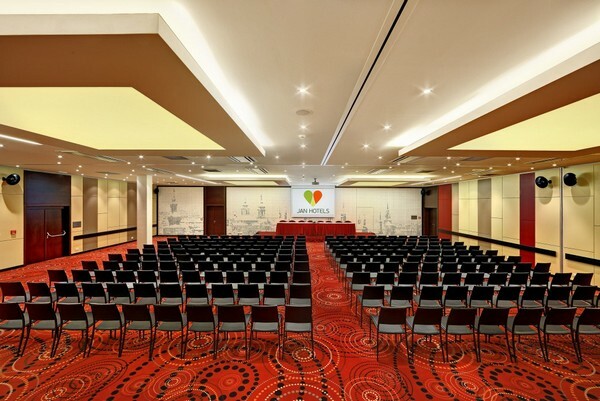 Hotel DUO is located opposite the Strizkov subway station. Travel from the the Vaclav Havel Airport Prague takes about 50 min. The PIT ticket costs 32 CZK (available from a booth or from the yellow ticket vending machine) and is valid for 90-min ride including travel also in the subway and trams (validate ticket when you get on the bus in the validating machine). For longer travels within Prague you can buy also short-term tourist passes valid for periods of 24 hours (110 CZK) or 3 days (310 CZK). Subway operates from around 4:45 a.m. and the last train leaves its station of origin at midnight. Night trams and buses must be used when the metro is closed. 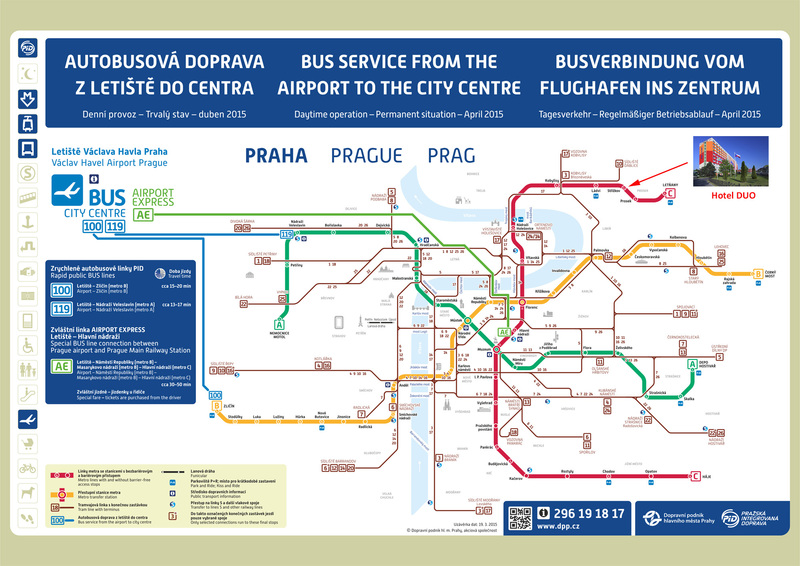 See this website for more information about fares and public transport in Prague. Airport Express (AE) to city centre: A special airport bus AE providing direct connection from Prague airport to the Main railway station (Praha Hlavni Nadrazi). From there continue by subway line C from "HLAVNI NADRAZI" station to "STRIZKOV" station (direction LETNANY). Bus AE operates from 5:30 to 22:30. The regular Prague public transport tickets are not valid in Airport Express bus line, you have to purchase ticket from the driver. The ticket costs 60 CZK, it is non-transferrable, valid for single-trip on is particular line only. For subway you need to buy PIT ticket which costs 24 CZK (available from the yellow ticket vending machine at station) and ticket is valid for 30-min ride. Minibus to city centre: The minibus CEDAZ service operates from the airport to the city centre. It is a shuttle transport and the terminus is in the city centre - Namesti republiky (Republic Square) at the CSA City Travel Centre near to the Renaissance and Marriot hotels. The price for one person for transport from the airport to the centre is 150 CZK. From there continue by metro (line C) to the Hotel DUO. The shuttle operates every 30 min. More details at CEDAZ website. Taxi: Price from the airport to the Hotel DUO should be about 700 CZK (see e.g., this website).